Theophilus Presbyter, the first to write about joining glass using the came technique in the book De Divers Artibus. Theophilus was a Benedictine Monk who was a glass worker who practiced in the late 11th and early 12th centuries. Came can have a flat, rounded, or “colonial” profile, and aside from a few specialty and perimeter cames (U-channel), is based on a variation of the letter “H” and ranges from 1/8” (3.2mm) wide to 1 1/4” (38mm) wide. 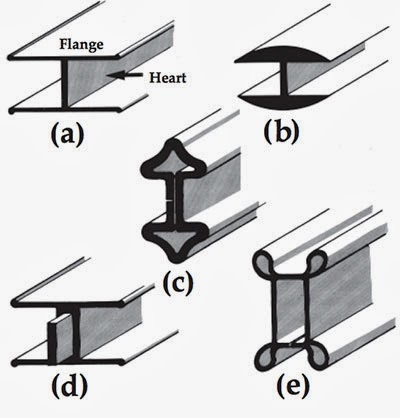 The cross-section strength of came varies depending on the thickness of the heart and flanges. Occasionally, came with reinforced (double) hearts or a steel core was used for rigidity, usually in doors and sidelights. Such came added strength at the expense of flexibility and was typically used for rectilinear designs, or for strategically placed reinforcement within a curvilinear design.